Our upholstery cleaning service starts with vacuuming to extract all of the pet hair and other particles on the surface of the furniture. Then our technician applies The Natural® to your furniture. The Natural® is green-certified and safe for your furniture and your home. The Natural® contains no chemicals or soap. It uses carbonation to create millions of tiny bubbles that lift the embedded dirt to the surface of the upholstery where it is exposed for cleaning and removal. Our HCE equipment uses heated extraction and hoses for suction to remove the exposed dirt and allergens from the furniture. All waste and particles are retained in our disposal tanks. The entire furniture cleaning process requires no more than 15-20 minutes per piece of furniture (depending size). Our methods require extremely low amounts of moisture so your furniture dries extremely fast. Usually within just a couple of hours. Newer furniture is made with a manufacturer’s stain guard or protectant but that wears off after 12-18 months. Chem-Dry of Fort Wayne can add a new layer of protection with our Chem-Dry Protectant. The protectant creates a new barrier to repel liquids and spills and help prevent permanent stains or damage to your furniture. We offer protectant as part of our carpet cleaning too! 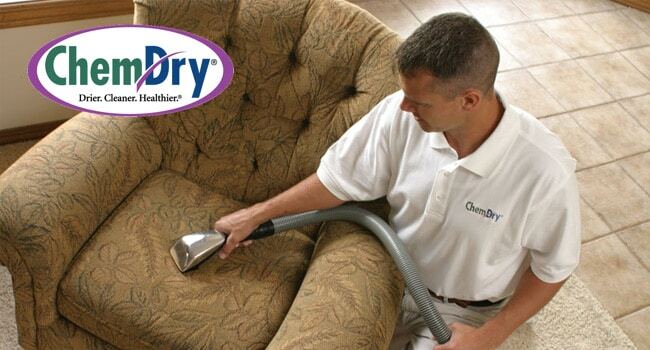 You also have the option to add Chem-Dry Sanitizer to our upholstery cleaning service. Our sanitizer is one of the healthiest cleaning products available and helps to remove over 89% of airborne bacteria in a home. This is highly recommended for allergy sufferers. Our customers receive a 100% satisfaction guarantee. If you aren’t satisfied with your upholstery cleaning service or results from Chem-Dry of Fort Wayne, call us at (260) 409-1138 and we will do our very best to help rectify the situation. Expert cleaning service eliminates allergens and dirt from carpet using green-certified solutions. Professional rug cleaning to remove dirt and bacteria from area rugs, runners and Oriental rugs. Commercial carpet cleaning from Chem-Dry of Fort Wayne for local businesses in Allen County, IN. 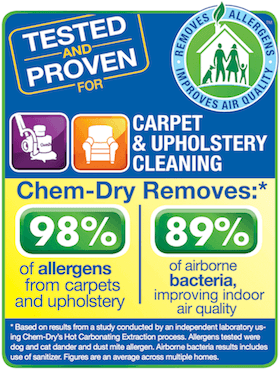 Chem-Dry solutions and innovation for successful removal of difficult carpet and upholstery stains. Our pet urine odor removal service features our powerful P.U.R.T.® cleaning agent for fantastic and safe results. Use our FREE ESTIMATE form to receive an estimate from our staff. Find us on Facebook: Posts include local news, recipes, pet care, cleaning tips and service information. We want to hear from you! It’s great when customers provided feedback. Please leave a review for us here.